Surprisingly, pastels (which are usually a staple in Spring) have been huge this Winter. I personally couldn't be happier because there is something so whimsical about pastels during the Holidays. I am even happier because I have teamed up with my fellow fashion blogger and sorority sister Theresa from Oh, Ivory to show you two ways to incorporate pastels into your Winter Outfit! Check out her blog here to see her take on this girly trend. When I saw Eva Mendes rocking a big pink coat, I knew it was time to bring my old pink trench that was collecting dust out of the closet. I then started seeing a resurgence of pink coats and now I'm just relieved I didn't get rid of it that one time I considered donating it. I guess I had an inkling that one day I would put this coat to good use- with trends being so cyclical, I guess you never know! 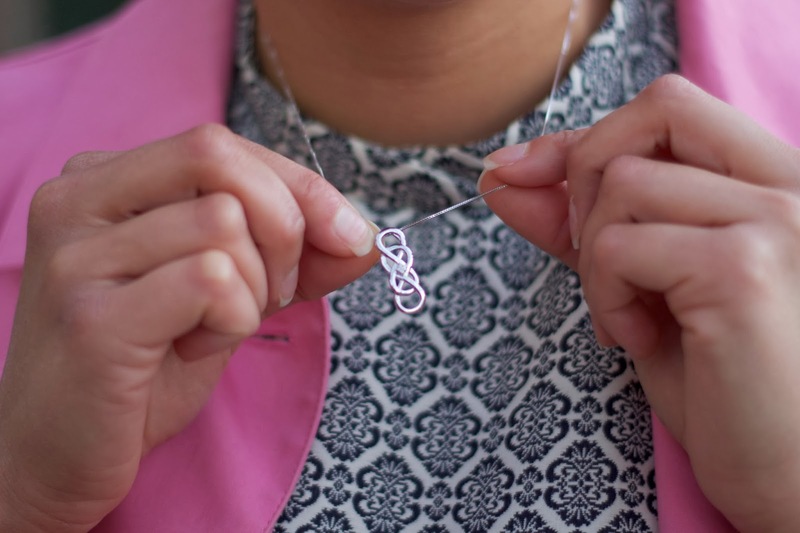 If you're an avid watched of the show Revenge like I am, you will recognize the symbol of my necklace from an exclusive line for Helzberg Diamonds® inspired by TV's hottest show! They have so many cool pieces with the symbol- check them out here! About the Outfit: Gap Coat (similar), Forever 21 Dress, Marshalls tights c/o, Zara heels, Helzberg Diamonds® Infinity x Infinity (TM) necklace c/o. I love that coat, i want it too! I adore your pink coat! OMG! I think I need one right now! Looks amazing! Awesome jacket! Love the colour! Great style! I love the coat! Just found your blog and really like it! Would you like to follow each other on GFC, Facebook or bloglovin to stay in touch? Let me know, thanks! Que linda!!! I love pink on you! and Theresa looks great as well! Me encanta tu abrigo rosa!!!!! Pau te escribo para desearte unas felices fiestas en compañía de tus seres queridos, llenas de amor,paz, alegría y espero que el próximo año sea de mucha abundancia para ti. 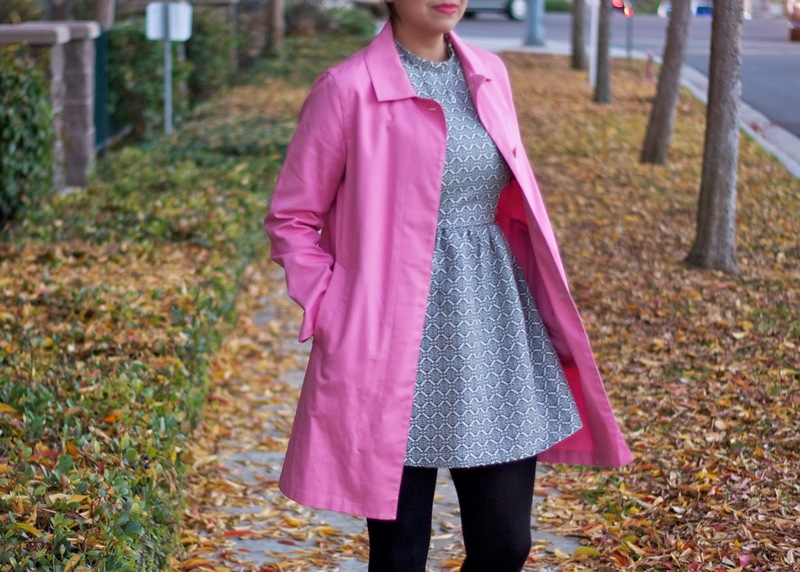 I am loving the pink coat trend as well, I love how you paired it over print. You look great as usual!